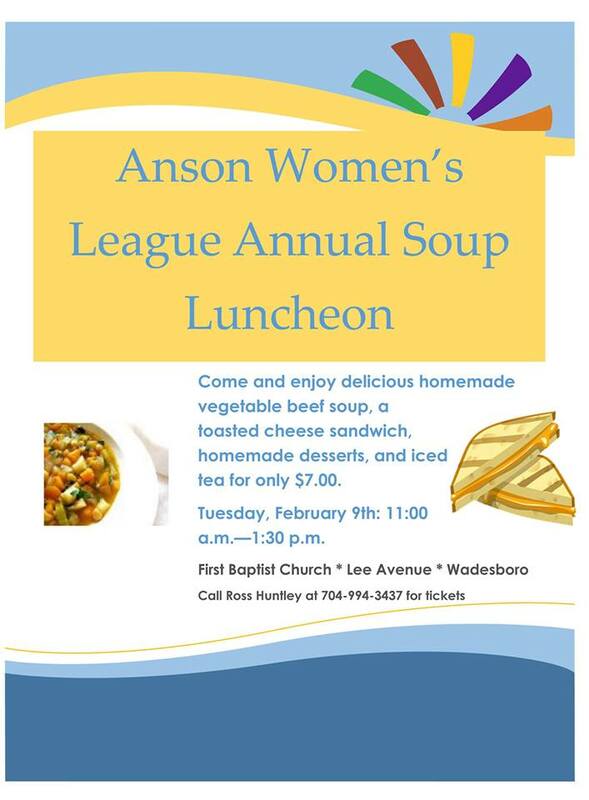 The annual soup luncheon raises funds for the Anson Women’s League many contributions to the community, including our annual scholarships for Anson County graduates! Come join the fun and enjoy delicious home-made vegetable-beef soup, toasted cheese sandwich, and your choice of wonderful homemade desserts! Tickets are $7.00. Contact any AWL member. Phone in bulk orders for pick-up by calling Bonnie Morgan 704-695-5373 or e-mail: bonnie.morgan@windstream.net. Wadesboro, NC – Wednesday, January 10, 2018 – The American Cancer Society Relay For Life of Anson will host a community kickoff on Tuesday, January 30th at 5:00 PM on the Wadesboro Town Square. Everyone is invited to join the festivities and learn about how to help the American Cancer Society save more lives from cancer. The event will celebrate and honor local cancer survivors, patients and caregivers, and showcase how funds raised benefit the local community. Rocky River Baptist Church Children’s Choir will perform. Guests will have the opportunity to register a team for the Relay For Life event, which will be held on Friday, May 11th at Anson High School. The Relay For Life movement is the world’s largest fundraising event to save lives from cancer. Uniting communities across the globe, we celebrate people who have battled cancer, remember loved ones lost, and take action for lifesaving change. During Relay For Life events, members of each team take turns walking or running around the track or path. Teams participate in fundraising in the months leading up to the event. Visit RelayForLife.org/ansonnc to learn more about the event, or contact Cameron Whitley at 704.552.6147 or Cameron.whitley@cancer.org. Annual Writers Club contest kicks-off! The ACWC publishes the winning entries in “Anson Pathways” every three years. The schools are very cooperative in this contest and encourage their students to submit entries, All genres, poetry, prose, fiction, and non-fiction are welcome. Copies of the rules and entry forms will be available at the Hampton B. Allen Library and at the schools’ media centers. All entries must be mailed to the Anson County Writers’ Club 2017 Contests, P.O. Box 363, Wadesboro, N.C., 28170; or turned in to the Hampton B. Allen Library in Wadesboro by 5:30 p.m. on Monday, December 4, 2017. The Anson County Chamber of Commerce, in conjunction with Anson County Cooperative Extension and the Brown Creek Soil and Water Conservation District, cordially invites you and your guest to this year’s Farm-City Week. The dinner and program are scheduled for Tuesday, September 19th, at the Lockhart-Taylor Center of South Piedmont Community College located in Wadesboro. Doors will open at 6:00 PM with dinner served at 7:00 PM. Come and join us for the reception and dinner, and enjoy celebrating agriculture in Anson! Please call the Extension Center at (704) 694-2915 by Wednesday, September 13th to RSVP. Anson County Website Design by M Design Group, Inc.